Organising a picnic for your child’s birthday? Then you probably need to send out a birthday program to the parents of the children you’re inviting. Our sample birthday program templates are ideal for this purpose. You can add the entire program details on these example templates. You can also see Birthday List Templates. From details like what time the party will be departing, where the children will be going, what time will the gang be returning and other details. The templates have beautiful borders and birthday related images on them. From balloons to cakes, cupcakes, animated characters there are several high resolution icons on these templates too. You can also see Birthday Templates. Invite your friends and near and dear ones to your birthday party in style with the help of this amazing template. The sample is designed in black and white and formal text, but the template offers the user a lot of customizing options. 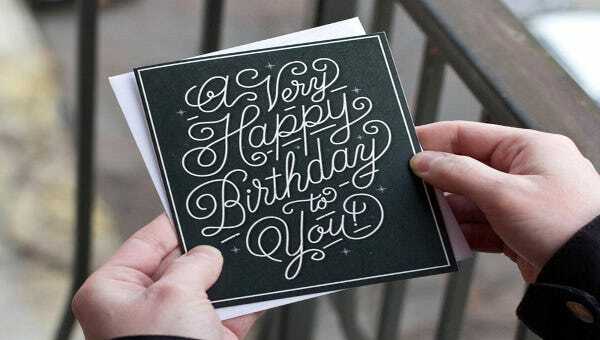 This template serves a dual purpose, it can be sent out as both an invitation as well as a birthday card. The template is like a postcard with a picture and text on one side and the space for the address and the letter on the other. Use this template to print out a large colourful banner for your special day. The template gives the user a lot of options in choosing colours, shapes and font styles. It is a simple easy to use template that serves the purpose. Create an astonishing invitation card for your birthday. A card so amazing that people just cannot turn down your invitation. The sample is of a string of lights drawn on a chalkboard. It can be easily edited to fit the theme of the party. This is the best template to be used for children’s birthday’s and best of all it doubles as a post card. 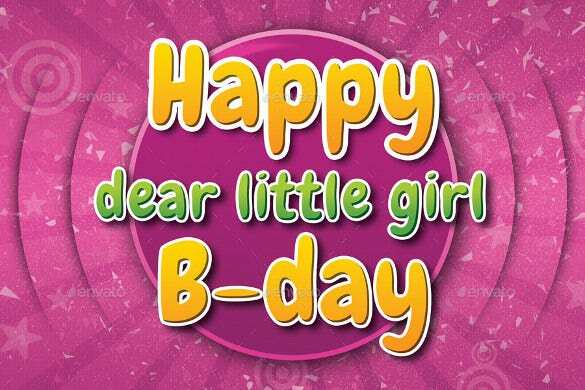 The sample is in pink and is for a girl’s party but the colour and font can be changed to the users desires. 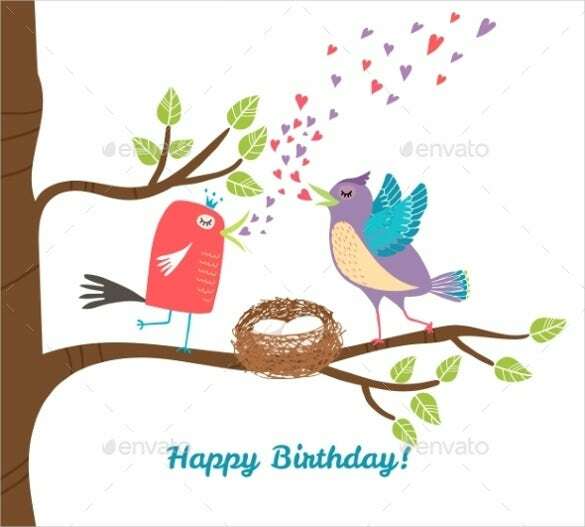 Let people know about your birthday or wish you close ones on their birthday with the help of this great template. It serves two purposes, it can be edited to look like an invitation or like a cool birthday card. A birthday is incomplete without a good cake and this template keeps that in mind. The sample template has a picture of a two tiered cake as well as small balloons, party hats and a cup cake. A simple, easy to use and popular template. Announce your party to your friends and family with the help of this bright glittering postcard template. With bright colours and a sparkling design this has an amazing visual appeal. The backside is like a postcard so that it can be sent easily. Print out a large banner to hang for your amazing birthday party. This is a tried and tested pack of templates that allow you to print out large customized banners. There is a lot of freedom to edit colours and text. 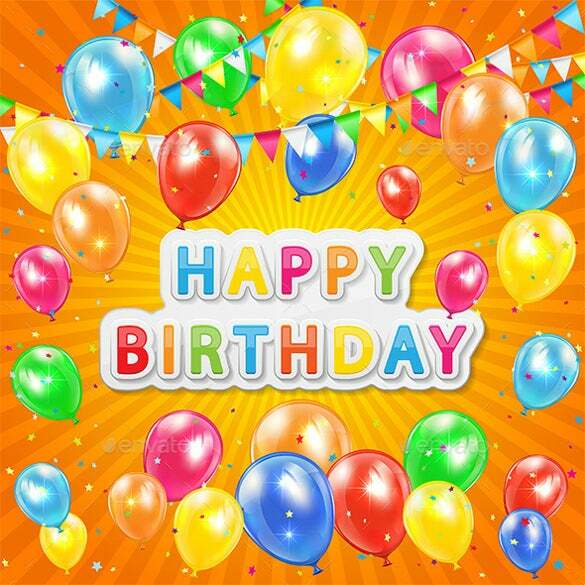 Print out amazing backgrounds for your birthday party with the help of amazing templates. 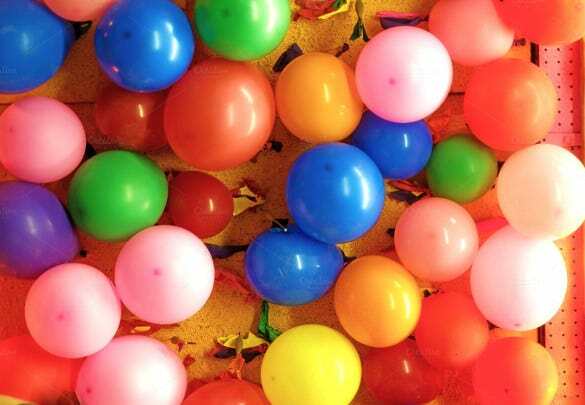 The sample shows a wall covered in balloons but there are plenty of other backgrounds to choose from. This is a popular template among users all over the world. A great birthday party is not complete without a few balloons and this idea has been kept in mind when designing this amazing template pack. The pack offers a whole range of templates which use balloons as their main element. 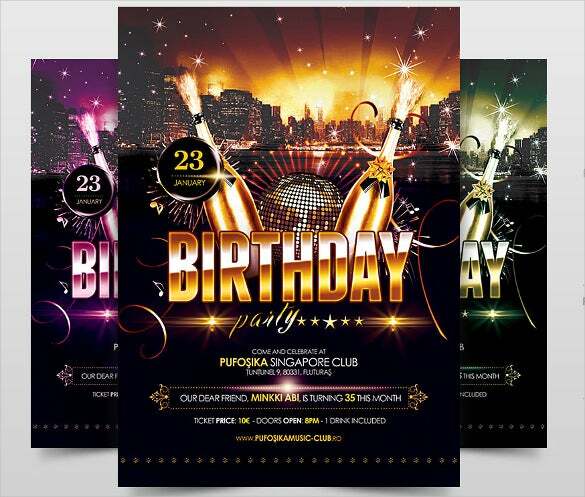 Create a glamorous birthday invitation flyer with this amazing flyer template pack. The sample pack is brightly coloured with a black theme and champagne bottles. The theme offers a lot of customization and lots of text editing options for the user. 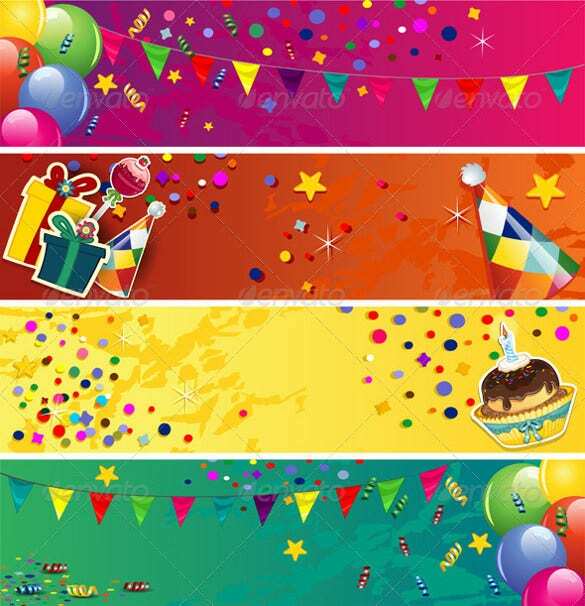 Celebrate your birthday with a lot of colours with the help of a large bright banner of multiple colours. This is an amazing template, tried and tested by numerous users. With a whole range of customization options ranging from colour and font this is a great template. 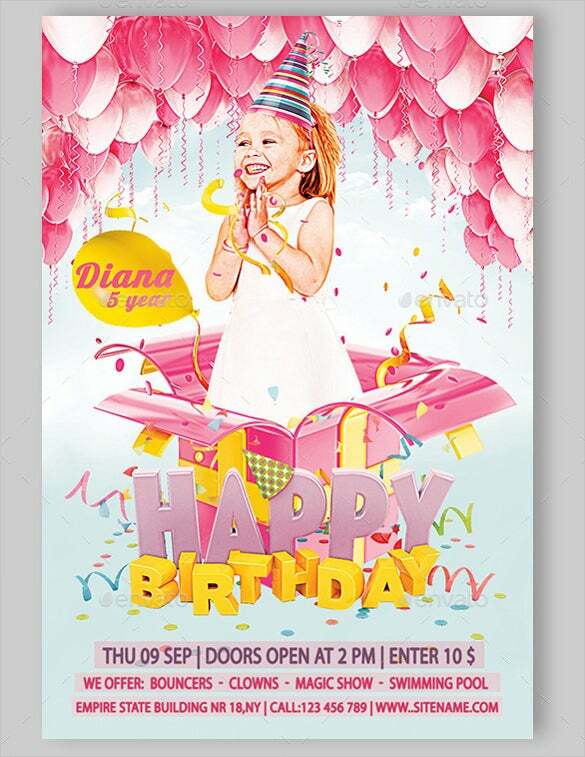 Invite your near and dear ones and all your friends to your birthday party with a beautiful flyer designed as per your specific needs. The sample shows a pink theme for a young girl’s birthday party but it can be easily modified to suit your needs. 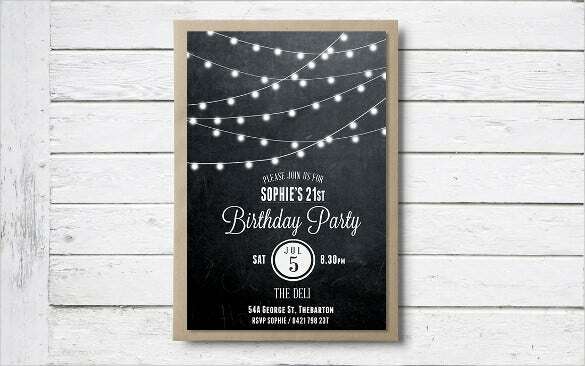 Whether it is a formal theme or a casual this template is the perfect one to suit your needs. This is quite popular among users across the world. 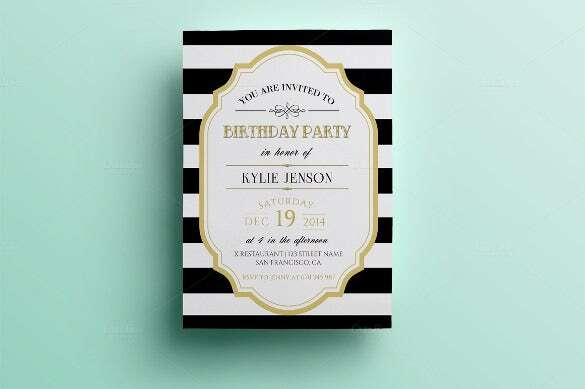 The sample shows a formal kind of invitation with flowers and a white theme.